Strength for the Journey 2016 (San Diego & Hawaii) – A 6-day summer retreat for persons living with HIV/AIDS is coming to San Diego and Hawaii. Take a look! Watershed Discipleship Workshop (Eco-Justice Collective) – w/ Ched Myers, an interactive workshop exploring intersections of the seminary, the streets, and the soil. Small Church Academy (Hawaii) – A time of learning and discussion on strengthening the small church. For churches under 200 in worship, this workshop will encourage you & give you practical tools for small church ministry. Church Growth for the Mid-Size Congregation – How do we strengthen and grow our mid-size churches? Come and learn from a leader who has done this in multiple churches (and is currently starting a new faith community!). Accessibility Grant 2016 – Churches often need help to raise money for accessibility projects or to start an inclusive program. This grant is designed to provide seed money or to help when fund-raising is falling short of the goal. 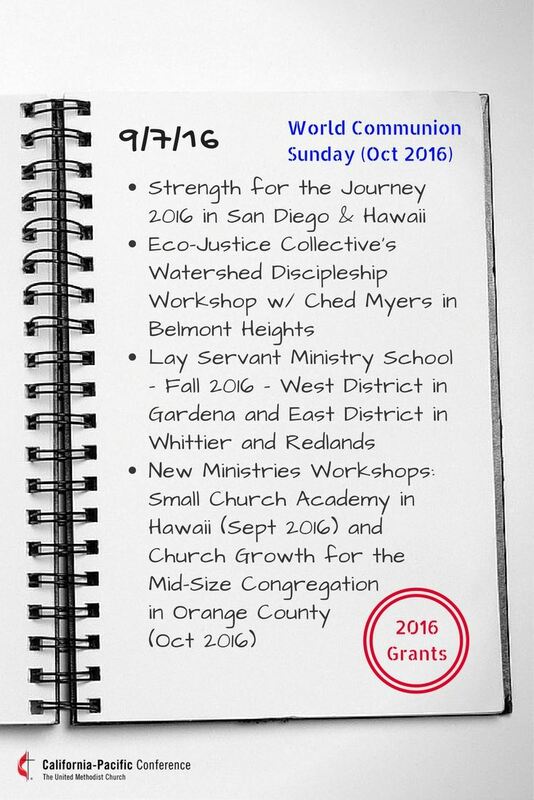 Peace with Justice Grant 2016 – For local churches, agencies, and community organizations within Cal-Pac that carry out the mission of the Conference Peace with Justice Committee.